In today’s world, with all the needs and distractions and instant gratifications, many people find themselves disconnected from their true, higher Self. Caught up in the struggles of everyday life, they lose sight of the awareness of who they truly are and what their life and soul purpose is. They live with the scars and consequences of unhealed deep emotional wounds, and experience scarcity consciousness in different areas of life. Could that person be you? I certainly was that and still am at times. Having been on the spiritual path for many years while still leading a normal life, I experienced many dark nights of the soul where everything about my life appeared meaningless and futile, only to realize that it was a gateway to a deeper understanding of myself. I experientially realized that unless the core within me healed from the wounds and incomplete parts, it is not possible to experience the higher Self consistently, and it is not possible to experience the abundance of life in all its dimensions. From the awareness that was awakening within me, I realized that I could help people holistically integrate spiritual principles into their everyday life to help overcome negative patterns. 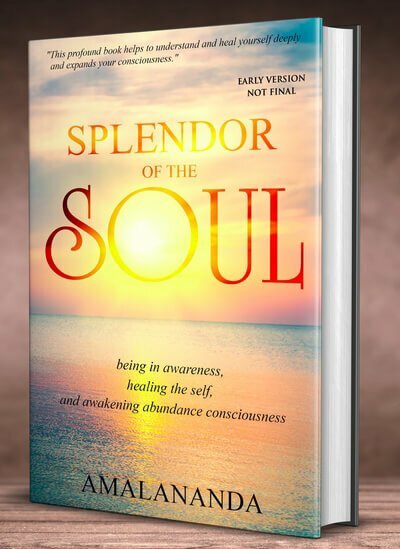 In my upcoming book Splendor of the Soul, I am weaving together the insights and experiences that I have gained coupled with guidance from my teachers and the wisdom of the ages. I sincerely believe that the book will help people raise their awareness, to heal their inner Self and to awaken abundance consciousness. In one sense, this book is for me too, to help me practice what I am writing. Through regular newsletters and blog posts on this website, I will share with you regularly how we can dive deeper within and how to balance our spiritual and material lives by unifying them. If you would like to see specific topics addressed, I would love to hear from you. Click here to get the Ekatvam Heart’s Wisdom newsletter. I have so-far found the excepts from the book, as well the practices and guidance given on this website, to be of particularly high quality. The deepest principles are explained, as well as their practical utilizations, all very clearly and concisely. I look forward to getting a copy of the book, and expect that it will be a useful signpost to refer back to repeatedly on my spiritual journey. Thank you for your kind words, Steven. I appreciate it and am grateful that the book can help people on their spiritual journey.